Every year thousands of pilgrims make the difficult climb up the Mountain of Light to the Cave of Hira where the Archangel Gabriel delivered to Prophet Mohammad the first revelations of the Qur’an. 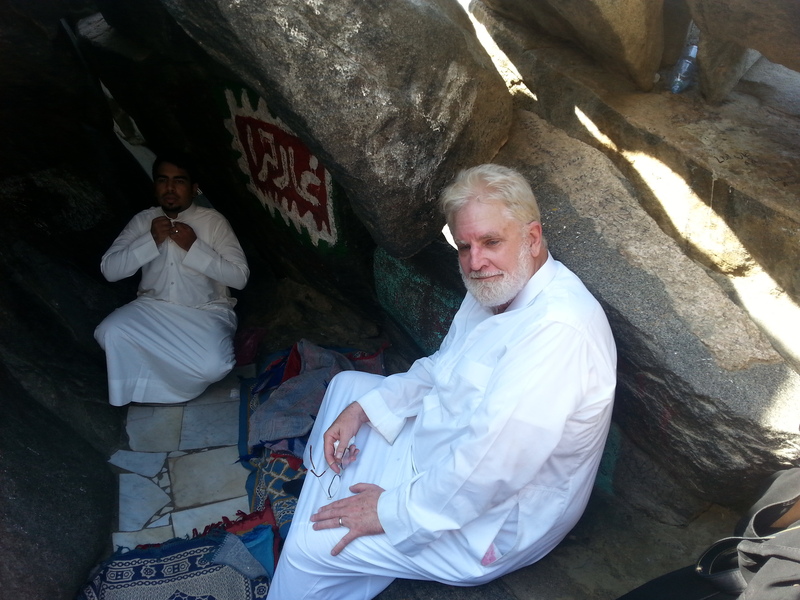 As a dinner guest at the home of Dr. Safi and Eman Kaskas, I mentioned that I was interested in someday visiting the Cave of Hira, about 3 miles north of Mecca, a place known by Muslims as the place where the Prophet Mohammad received his first revelation of the holy Qur’an from God as delivered by the angel Gabriel (Jibril in Arabic). Another dinner guest, renowned Saudi poet and writer Nimah Nawwab, immediately phoned a friend, and early the next morning found Dr. Safi, Eman, Nimah, Hisham, the muadhan (‘caller to prayer”) Shafik Zubir from our local neighborhood mosque and me in an SUV bound for Jabal al Nour (the Mountain of Light). 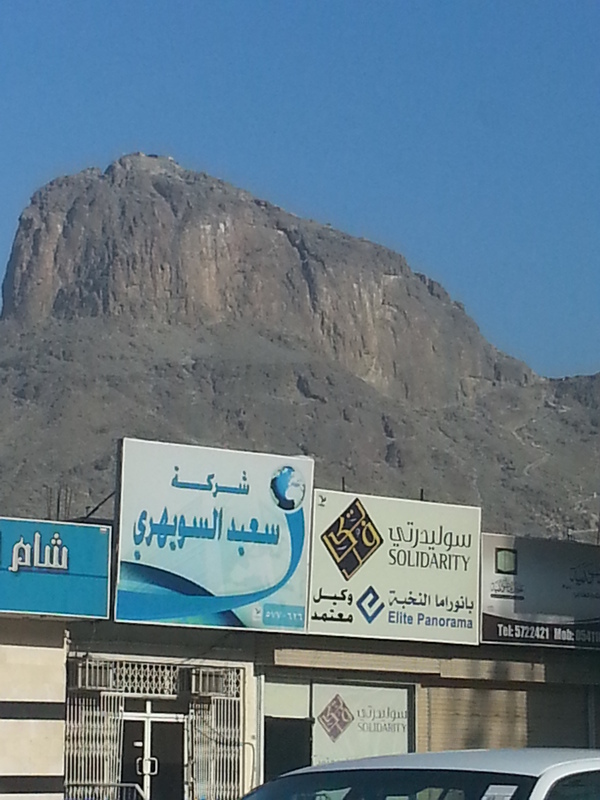 The Cave of Hira is a cave just below the back side of the peak of the mountain. It is about 3 miles (4.9 km) northeast of the holy city of Mecca, in Saudi Arabia. The cave itself is about 12 feet (3.7 m) in length and just over 5 feet (1.60 m) in width. One must climb 890 feet to the summit. That’s like climbing the stairs of a 90-story building—no small task for the older members of our adventurous troupe. I needed help and direction getting up much of the way and especially a lesson in contortion in order to squeeze through some of the smaller 8 to 10-inch crevices between the rocks surrounding the cave. At 65 I found my legs and knees weaker. It was a difficult, difficult climb, but I was blessed to be able to complete it with the help of two men—one from Pakistan and the other from Kashmir. The oldest surviving biography of Prophet Muhammad is that of Ibn Hisham (833 CE), which is a freely edited version of Ibn Ishaq’s (ca. 704 – 767 CE). In this biography, Ibn Hisham tells us that before the revelation of the Qur’an Muhammad used to retreat for a month every year in a mountain called Hira in Mecca. When the prophet would finish his seclusion he would return to circumbulate the Ka‘bah seven times before heading home. Imam Muhammad Al Bukhari (810-870 CE), whose compilation of sayings and deeds of the Prophet Mohammad is highly regarded by Sunni Muslims, gives a slightly different account: The commencement of the divine inspiration to the Messenger of God was in the form of “good dreams which came true like bright day light.” It is then said that the prophet was endowed with a love of seclusion. He would go to the Cave of Hira where he would worship God alone–continuously for many days before he would desire to see his family. He used to take with him a provision of food for the stay and then come back to his wife Khadija to take food for another stay, until suddenly the Truth descended upon him while he was in the Cave of Hira. According to Al Bukhari, Mohammad related, “The angel caught me forcefully and pressed me so hard that I could not bear it any more. He then released me and again asked me to read, and I replied, ‘I do not know how to read.’ So he caught me again and pressed me a second time till I could not bear it any more. He then released me and again asked me to read, but again I replied, ‘I do not know how to read.’ So he caught me for the third time and pressed me, and then released me and said: ‘Read in the name of your Lord who created. He created man from a clot. Read and your Lord is most honorable who teaches by the pen. He taught man what he did not know” (Qur’an 96:1-5). Although the overwhelming majority of scholars believe the verses of chapter 96 above are the first to have been revealed, some others have disagreed. For instance, in his famous exegesis of the Qur’an, At Tabari quotes some who insist that the first verses of chapter 74 were the first to be revealed. However, in addition to his citation of those who argue that it was the verses of chapter 96, Al Bukhari also quotes a number of transmitters of prophetic sayings who claim that those verses of chapter 74 were revealed first: [The Messenger of God] said: “I went to stay in Hira. After finishing my stay, and while I was coming down, I was called upon. I looked right, left, in front, and behind, but could not see anyone. But when I raised my head I saw something. I then came to Kadhija and said: ‘Cover me, and pour cold water on me!’”He said: ‘They covered me and poured cold water on me.” He said: “Then the following verses were revealed: ‘O you who are clothed! Arise and warn! And your Lord do magnify’” (Qur’an 74:1-3). In Al Bukhari’s renowned exegetical work, Al Qurtubi he adds another two opinions–one of which claims that chapter 1, known as Al Fatiha, was the first to be revealed, and the other claims it was verse 6.151. Muadhan Shafik Zubir and Sam inside the Cave of Hira–once a place of sanctuary and meditation for the Prophet Mohammad. Despite the conflicting accounts and the impossibility of finding out the exact details of the first revelation of the Qur’an, Muslim scholars and historians have not disputed the fact that the Prophet used to retreat to the Cave of Hira near the summit of the Mountain of Light for worship, and the overwhelming majority agree that it was during one of those seclusions that the first verses of the Qur’an were revealed. The books of Prophetic sayings also mention at least two instances after the revelation of the Qur’an in which the Prophet “climbed up to Hira.” In one instance he was with a group of his companions when the mountain shook. Many prophets from the Abrahamic faiths (Judaism, Christianity and Islam) fled into a desert wilderness or hid in caves for safety or respite–seeking peace, emotional healing and protection while being alone with God. Moses, Ezekiel, John the Baptist, Jesus, the Apostle John and many others found times in their lives where the road of life became so narrow that there was simply only room for God and them alone. Indeed, obeying God is often difficult business, especially when you are confronted by an enemy that seeks to undo you emotionally and spiritually. In such times one embraces solitude in a desert or cave to be in solitude with the Almighty. One reads in the Old Testament that “Ahab told (Queen) Jezebel everything (God’s prophet) Elijah had done, and how he had killed all the (queen’s false) prophets with the sword. So Jezebel sent a messenger to Elijah to say, “May the gods deal with me, be it ever so severely, if by this time tomorrow I do not make your life like that of one of them” (1 Kings 19:2). Further it is said that Elijah “was afraid and ran for his life.” It is said that Elijah was directed by the Archangel Gabriel to get up and eat a cake of bread that lay by the prophet’s head and to drink water. Later, Gabriel “came back a second time and touched him and said, ‘Get up and eat, for the journey is too much for you.” So he got up and ate and drank. Strengthened by that food, Elijah traveled forty days and forty nights until he reached Horeb, the mountain of God” (1 Kings 19:8). There, exhausted and trembling in fear and depression, Elijah hid in a cave until the “still, small voice” of God said to him, “What are you doing here, Elijah?” God eventually relieved the prophet of his horrid depression; strengthening him and giving him hope for the future. have mercy on me, for in you I take refuge. Below, contemporary Muslim singer Sami Yusuf echoes our thoughts about the Cave of Hira and the first revelations of the Qur’an which began there. Take a few minutes to listen to Yusuf’s inspiring song and be encouraged!